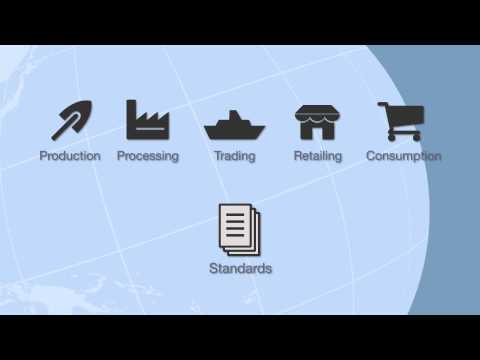 The Standards Map database contains information on over 230 standard systems, codes of conduct and audit protocols addressing sustainability hotspots in global supply chains. To review the list of participating standards, review the first module of Standards Map. Some of the standards apply to a multitude of products or services, and cover numerous countries, while others may be focused on a single product and a hand full of countries. Some of the initiatives similarly focus on specific issues, while others have requirements pertaining to several types of hotspots gravitating around the environment, social issues, economic viability, business ethics and quality management. Finally, participating standards are not all developed by the same type of entity. Some of ot eh participating initiatives have been developed by international or regional public authorities, respectively the International Labour Standards and the EU Organic. Others have been developed by the private sector, such as the GlobalG.A.P or the British Retailer Consortium. Others have been developed by the civil society, or by a consortium of public, private and civil society individuals. Users may use the first module of Standards Map to identify the standards on which they would like to focus their analysis. Should standards wish to take part in Standards Map, and respond to the aforementioned criteria, we invite them to contact us. One of the key features of Standards Map is that information has been reviewed by each respective standard-setting organization, or by individual experts who have been designated by the organization to fulfil the role of data reviewer. Indeed, the strength of Standards Map lies in its impartiality and the quality of its data which is verified by standard initiatives and the extent of the information provided, with over 1000 criteria analysed for each initiative. Standards Map is the only web platform providing information at such high level of detail. Standards' data in the tool is verified according to a process including third party experts and the respective standard organizations. Standards Map does not make value judgments or rate standards.